Sometimes there's not much needed to say about something after you're through with the title--and this may be one of those times. This is a trade card for Munn & Company, publishers of the Scientific American, then in its 29th year (which would be 1874). I'm pretty sure that this was all done as a joke, to catch people's ideal attention--especially since Bellew was a cartoonist, and a very well-known one at that. (For example, he created this iconic image of Lincoln, below.) But the image is certainly arresting enough, odd enough, semi-insane enough, to have the casual nod turn into observation. A Beautiful Jackhammer--Lovely Design, 1928. There are sometimes exquisite images found in the mundane and every-day, beautiful objects hiding in plain site. Perhaps that is all there is, really, everything around us being available for beauty just for the looking-at-it, finding it. (See an earlier post, The Beauty of Ball Bearings, for example. There is another series of posts on Looking Hard and Closely at Prints, which is more like taking a paper microscope to complex prints and finding the glorious minuatiae lurking in their minimal worlds.) In this quick example here I was stopped by what looks like a fantastic illustration of a jackhammer found in the Der Bauingenieur, Zeitschrift fuer das Gesamte Bauwesen for 24 February 1928--right there on the front cover. 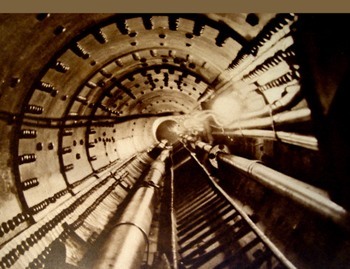 It is one fine piece of design, and may be the finest imaging of a jackhammer I've seen. There are many posts to this blog on this Looking Straight Down topic--just enter this phrase in the search box at left for a list. This series of images was found in Nature (September 3, 1885, and already well established and in its third decade of publication) and shows a very scientific exploration of looking straight down. 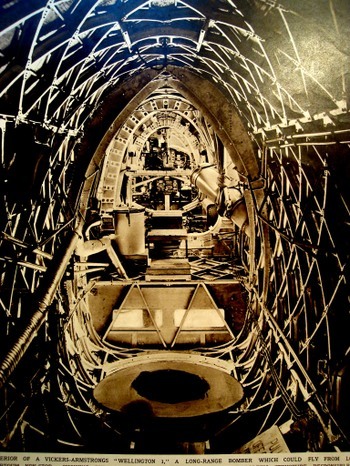 The images show the pioneer and bibliophile Gaston Tissandier and his equipment and their position in the research balloon engaged in "photographic aerostation". Their experimentation was a clear success, the results of which were immediately applied to cartography, with the journal reporting "aerostatic photography has a great future". And so far as the looking-straight-down part is concerned, it certainly crytalizes a moment in time in that part of visual history. I welcome the chance today to use our non-classical Homer instead of the beautiful Paolo Uccello to look at an issue of imaging a certain form of perspective drawing. 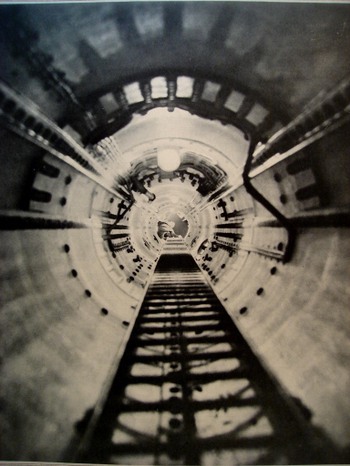 I've always been intrigued by antiquarian images that looked straight down, or up, at things--90 degree, perpendicular, real straight-on stuff, giving a feel for depth (or height) and perspective. Funny thing is that in the wide world of scientific images, they really don't show up very often. 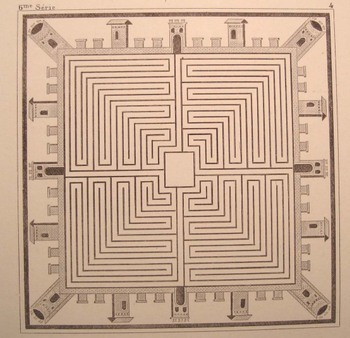 A Mock-straight-down is found in this prettily-designed example (French, ca. 1860)--it seems to be view form a height of 250 feet or so down on the square of a low- (Western) renaissance town. That's partly true, except that it is a mosaic from Pompeii (or Herculaneum), found embedded in the floor of one of those mummified houses. 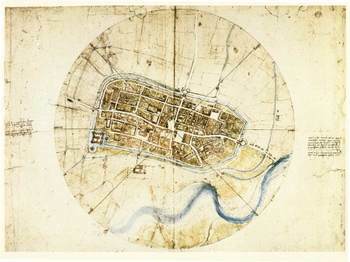 The drawing by Leonardo of the town of Imola (currently resident with the Windsors) does come quite close to the concept--it has more artistic features than the common city plan , and is definitely at a perpendicular to its subject. 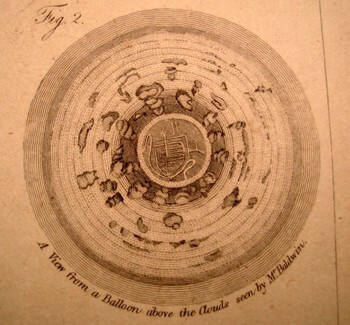 But it is this that is so terribly interesting to me--a small part of a little print from an unidentified encyclopedia from the turn of the 19th c. It shows a picture of the earth looking straight down from a balloon, looking through an opening in the cloud cover, down to a small town. There is an iconic work on the representation of the world as known to succeeding generations where the picture of the world is seen through a succession of gradually diminishing clouds (being opened like drapes over time), but I honestly cannot think of an early image of looking at clouds from above and straight down. My sense is that this image would have caused as muchinterest and wonder as the first (Soviet) images of the other side of the Moon (back in 1959). Even when moving into the pre-satellite 20th century image, the straight-down picture is a rarity. In the last few years after having looked at dozens of thousands of popularly-published images (for another project), the straight-down/up were a scant tenth or perhaps hundredth of a percent of the total. There were a number of photographs made looking straight up (as in the two examples here, looking up the main mast into the crow’s nest of the Queen Mary, and the other with the same view, only in the Bremen. I can't leave this topic without mentioning two recent additions to this genre--the first is the Eames' wonderful Power of Ten movie (go to youtube HERE, where in 40 steps we look at existence from quark to quasar. The second is a little goofy but I like it nonetheless--the introduction to the Jodie Foster movie Contact (go to youtube HERE) built on the bones of the Carl Sagan book. Here we swing out from the Earth and into space, following a broadcast-audio trail of humanity into the not-too-distant time/space (ignoring the signal degradation bit but so it goes), and then leaving that quickly behind, hurling itself backwards, to the outer reaches of the universe, until (and we don't see this in the youtube clip) we wind up back in the iris of the heroine (and a bit too much like the Dave Bowman trip in "2001 a Space Odyssey"). But we don't see stuff like this very often, and I'm happy to go along for the ride. It really is just about seeing something new, after all. camera,” and his face gets all pancakey. It's just not done “because it's goofy” he says. And at least in Homer’s case, the proof is definitely in the puddin’. Of the many portraits painted of Isaac Newton, the vast majority of them came after his death--some were fanciful, some were based on recollection, and others were based on the few examples that have survived painted of him in life. This happened quite a bit--even someone as esteemed as his semi-counter-rival, the great Robert Hooke, received no attention at all from portraitists during his lifetime. I found this lovely portrait of Newton--a miniature, nearly--an engraving by Laderer after the 1726 painting by John Vanderbank, made just a year before his death, and almost 40 years after he ascent to great fame. It is an image I don't see very often. The original is about 1.5x1 inch on a 10x7 inch sheet, and printed in ca. 1820-30. I'm unsure of the engraving's origin. The full version is below. THere's also this engraving, made of the same painting, and executed in the 1830's, that shows Newton in a little less flattering light--at least here he looks as though he has some decent age on him. 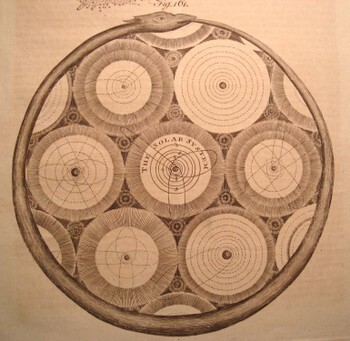 Yes, the heavens are made of circles, somewhat, especially if you were observing a three-dimensional figure in two-space, where all spheres are circles. But here we're making those observations the other way 'round. In any event, these are lovely images taken from a part of the history of astronomy images here in the bookstore--and I should say that they're all available for purchase from the store as well. But in the meantime, click away--you'll find that almost all are expandable and mine-able for design elements. Distribution of the Nebulae, ca. 1860. Dimension of the planets in comarison to the Sun, 1850.
the Solar System, ca. 1825. Partial eclipse of the Moon, ca. 1860. Total eclipse of the Sun, ca. 1860. This is a fine detail from a late 17th century print of Gemma Frisius (1508-1555). He died young but with many accomplishments, not the least of which was being a mathematician of stature. And a cartographer. And surveyor. And instrument maker. And physician. In the original print (available for sale in our blog bookstore) Frisius' eye occupy less than a half-square inch of paper--still they are powerful and direct in spite of their size. The legend of the engraving read "Gemma Frisius, Doccomiensis, Medicus et Mathematicus.Ut simulat solem radiantis gemma pyropi, Sic Gemmam artifici picta tabella manu: Haec vultum dedit, ipse animi monumenta perennis; Ne quid in exstincto non superesse putes. Vita escessit Louany VIII. Kal., Iun. MCLV, Aet XLVII." I was looking around for one of the original references to the earliest human-tech definition of "singularity" and found it in a roundabout way, a classic reference referenced in a classic paper on singularity. Vernor Vinge wrote a breakout paper in 1993 called “The Coming Technological Singularity: How to Survive in the Post-Human Era"1. Among many other things the San Diego State math prof quotes how the great Stan Ulam paraphrased John von Neumann saying: “One conversation centered on the ever accelerating progress of technology and changes in the mode of human life, which gives the appearance of approaching some essential singularity in the history of the race beyond which human affairs, as we know them, could not continue.” This was in 1958, and it appeared in Ulam's "Tribute to John von Neumann" in the Bulletin of the American Mathematical Society, (volume 64, number 3, part 2, pp 1-49). It struck me as ironic that the "singularity" would appear just at the time von Neumann2--perhaps without equal in this century in thinking in terms of the computer and its applications and overall sheer brain-power--died, Ulam surfacing the term in what was basically a memorial/obituary/celebration issue of the Bulletin, the carbon-based life-form container finally failing the great mind. It was then that I came to realize how much biologicalization has taken place in compsci terminology--not the least of which is the self-replicating and damaging "virus", which itself of course is a massive biological deal, though in the digital world it is not its most abundant entity3. E-viriology is found just about everywhere, much like its bio counterpart, which is located in every ecosystem on Earth. "Virus" emerges in a science fiction effort by Douglas Gerrold in 1972, a few years before they were artificially produced, which was a few years before a virus was released into the e-phere ("in the wild"). In 1975 John Bruner unleashes a "worm" in his Shockwave Rider. Others early viruses have biological names: Creeper (1970), Rabbitt (1974), ANIMAL (by John Walker, though not created for being malicious, 1975), Top Cat (1980), Elk (1982), Whale (1990), Hare (1996), Blackworm (2006). There are of course many more names for viruses (and company) that are not biological, but it struck me of how many of the earliest examples do have animal names. I'm not sure that I have much to say about this presently, though I did want to put the general observation out there in this note. 1. The abstract of the paper begins: "The acceleration of technological progress has been the central feature of this century. I argue in this paper that we are on the edge of change comparable to the rise of human life on Earth. The precise cause of this change is the imminent creation by technology of entities with greater than human intelligence. There are several means by which science may achieve this breakthrough..."
2. Perhaps of most interest here is von Neumann's 1949 paper, "Theory and Organization of Complicated Automata", which looks as the logic required for the self-replicating machine, in A. W. Burks, ed., Theory of Self-Reproducing Automata [by] John von Neumann, University of Illinois Press, Urbana, pp. 29-87. This was based on transcripts of lectures delivered at the University of Illinois, in December 1949, and then edited for publication by A.W. Burks. 3. "Virus" is an old word, and is Latin for "poison" or "poisonous", and which first appeared in English in 1392. "Virulent" appears in English in 1728, "viral" in 1948, "virion" in 1958. "Virus" as we know it bioloigcally today has a somewhat complicated history, escaping Pasteur and his microscope until it emerges (again) with Martinus Beijernick in 1898. This carefree stroll through the geology of death prep and care comes to us via the Embalmers’ Supply Company (ESCO) catalog, of 1941, serving and selling to members of the embalming profession since 1886. It provides the Practioner with all means necessary to scrape away facial muscle, cement the jaw, seal the eyes, color “old age” eyebrows, fill cancerous cavities, mold over gaping wounds, position the arms, contour the chin, scoop out the brain, replace the blood, pull out the bowels, and all other manner of removal/drainage/fillup, and then apply makeup to cover all suture wounds and other “deficiencies”. Darwinism Reproved and Refuted, published in Washington D.C. in 1873, is left without any attribution to the author, the writer not caring to sign his/her name, not even to use as the wood into which some shingle with a weak social sciences/psych/religious Ph.D could be nailed. It is just left to the imagination or indignation that the writer didn't or couldn't feel confident enough to actually sign their work. I went searching in the 1896 issue of the Scientific American Supplement for early articles on Roentgen's x-rays (discovered just months earlier) when--flipping through the pages--I came upon this very impressive part of a score. But what is more impressive is that it sets to music the sound of Niagara Falls--the music of the falls. At least music is what Mr. Eugene Thayer heard when he listened to the falls, and apparently he heard what few others did. See also an earlier post "In Closing: "a Kiss from Your Beethoven". Artistic and Literary Valedictions from the Master"
As all of you no doubt know Vincent van Gogh carried on a voluminous correspondence, mostly with his brother Theo. I sat down with the third (and final) volume of The Complete Letters of Vincent Van Gogh (Bullfinch Press, 2001) and read through his letters from St. Remy (June 1889 to May 1890, two months before his death 29 July 1890), as well as those from Auvers-sur-Oise (the last of which is dated one week before his death). The letters are remarkable, and were written mostly to his brother, but also to his sister, and mother, and some few others. The letters are filled with fantastic observations and captured vision, comments on his artwork, technical aspects of painting, philosophy, and daily life. And thinking. It has always been interesting to me how people slow down a letter so it can come to a halt, and Vincent--in addition to being an excellent observer and word curator--knew how to write a letter, and it is enjoyable to step back from them a bit to look at their mechanics, especially when it comes to this slowing-down section. So I've selected a few bits from what is usually the last part of the last sentence before the sign-off (hardly a rigorous process), just to see if there were the makings of a found-poem in them....and I believe there is. "I shake your hand, and your wife's too"
"And then it does one good to work for people who do not know what a picture is"
We did a little decoration of the house today for our younger daughter, who as it turns out is very interested in St. Patrick's Day. So there were green pancakes, green milk, and a green pastry, surrounded by all of the green markers we could find in the house, plus cut-out shamrocks, and piles of books bound in green or with green dust jackets. As it turns out, there are not many green books--just eyeballing it says low single digit percentage. The funny thing is that the green books are so interesting: for example, there's Lewis Carroll, Sylvie and Bruno; Stafford Artful Science; Schwillinger The Mathematical Basis of the Arts; Johnson's New Universal Cyclopedia, a Scientific and Popular Treasury of Useful Knowledge (in four massive volumes); The Working Classes of the United States (1867); Ed. Guerard Dictionnaire Encyclopedique d'Anecdotes; Bynum Dictionary of the History of Science; A Natural History of American Birds of Eastern North America; J.A. Symond The Renaissance in Italy (6 vols! ); Holmes The Age of Justinian and Theodora; Jenks The History of Australasian Colonies; Hall Color and Meaning; The Works of E.A. Poe; and The Works of Charles Dickens. The Dickens set is the so-called "Household Edition", which is shorter than you'd expect, the size of an old-standard paperback, but very nicely bound in a dark green linen that feels great in your hand. There's also the Collected Works of George Orwell, except those dust jackets are half green and half white, and it doesn't quite make it. But the way I see it, this list of green books would make a Green Year Reading List and would really add up to something on day 365. I saved the biggest green for last: The Physical Review. There were a few odd copies up here in the house (with R.P. Feynman contributions), but down in the warehouse there are easily two very large bookcases filled with them, a good green wall. The funny thing is that a younger sister publication, Review of Modern Physics, which is the same size and format as its older sister, is published with orange wrappers. And yet the two sit happily side-by-side...so far as I know.